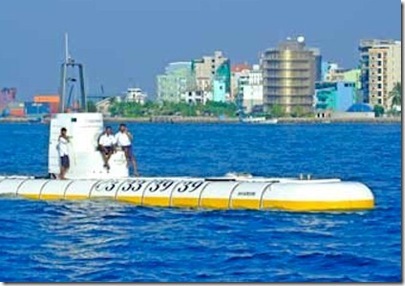 If there is one thing that defines the Maldives, it is water. The country seems primarily aquatic with dots of land for the convenience of the humans in the area. If anything, the Maldives have to contend with too much water especially in the climate change scenario which predicts rising oceans. But so much water doesn’t take away its preciousness. 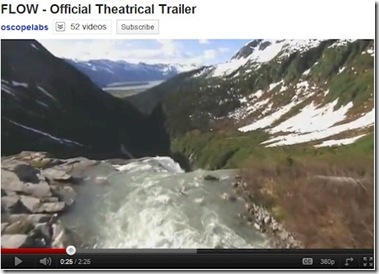 For folks interested in exploring the topic of water ecology further, I recommend the documentary Flow which is sort of a ‘Inconvenient Truth’ for water. So what are the differences between the ratings? What makes a 5 Star…and beyond? In many cases, I am over simplifying the distinctions, but in doing so I am hoping to highlight the core of the distinction acknowledging that circumstances and details can vary considerably and need to be taken into account. At least, the descriptions that have assembled here provide a starting point for breaking down what these differences of expectations and offers. Casual – 3 star: This category is the budget domain. This is literally ‘basically’ a room. A bed (no guarantees on lumps and typically either too hard or too soft). Often lots of signs of wear all around including something that doesn’t work properly or fixed haphazardly (like a fitting replacement that doesn’t match the others). Smart – 4 star: This category of rooms the heartland of value resorts. The rooms are clean, fresh, well equipped and well maintained. The resorts have invested in fresh paint, and good maintenance. But beyond that, nothing really stands out. The materials and fittings used are on the conventional side. Nothing really stands out in terms of style or design. Often the layout is just a bit awkward with big empty spaces in some areas with tight squeeze in others. 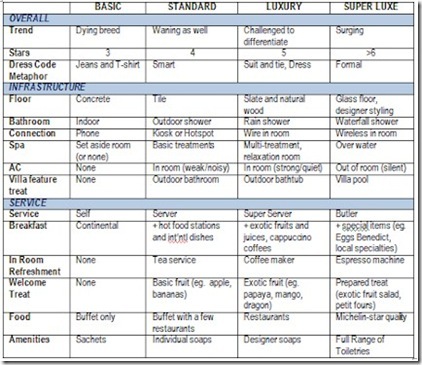 Elegant – 5-star: This category is the domain prevalent high-end resorts. The rooms have a real aesthetic design sense with style. They use higher quality materials and fittings. Extra services will be laid on. Wide selection of finely prepared food is on offer. Luxurious – >5 star: This category is the domain of the increasingly prevalent super-premiums. It is a full 5 star…with extra helping of extravagance ladled on top. So what does that mean more specifically? I’ve drafted the table above based on my experiences to help provide some illustrative (not comprehensive nor definitive) examples of the differences. When I say ‘Dress Code Metaphor’ above, I don’t mean that is the ‘dress code’ for people on the resort. I mean that if you were describing the ‘dress code’ of how the resort was ‘dressed up’ as a property, this is how it would boil down. The considerations above are intended to be the minimums. For example, many ‘Luxury’ or ‘5 Star’ resorts offer butler service, or glass floors, or eggs Benedict. Those offerings alone do not make them ‘Super Luxe’. But if a resort aspiring for ‘Super Luxe’ does not have them, then one has to call into question their claim to that standard. To quote 30 Rock, the absence of these things are sort of ‘Deal Breakers’. I tried to keep to areas where I could show a variation across all four groupings, but there are other demarcations. For example, a 5 star and 5+ star should never have plastic furniture (unless it is very distinctively styled). That’s a deal breaker on the 5 star rating. Another example is resort features. 3 and 4 star don’t require these, but 5 star and better do. 5-star is typically a special bar, restaurant or spa almost always over the water. Super 5+ needs to be something even more imposing. 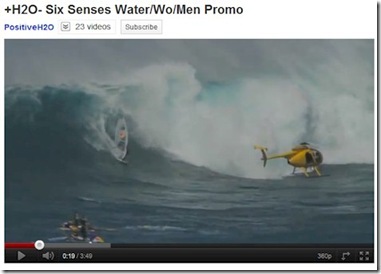 A few super premiums have even gone underwater (eg. 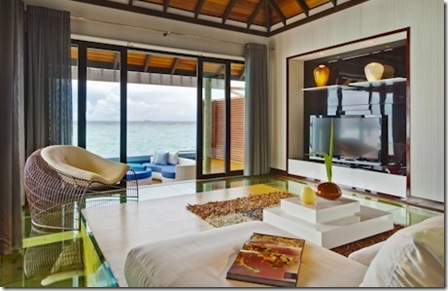 Conrad Rangali, Huvafenfushi) to attain that special distinction. Another consideration to note is that this smorgasbord of options is a moveable feast. Especially in the ever escalating wow-factor arms races, what used to be exceptional is often now conventional. What used to be a big bet, is now table stakes. For example, when I started coming to the Maldives, there were no spas nor Internet. Now, it’s inconceivable not to offer these things. So what the heck does ‘5 Star’ mean? With limited supply and the desire to earn as much as possible from the sustainable natural resource of the idyllic islands of the Maldives, the country and industry is rapidly moving to premium at nearly every property. Now there are at over 100 active properties out of which more than half call themselves ‘5 star’. 39 of resorts on Trip Advisor, for example, are listed as 5-star. Of those, 8 have Review Ratings at a full 5-stars as well which is a start. When everyone is 5-stars, is there any difference? Actually, there are massive differences. So how does one regulate the star awards? Adrian Neville called attention to the issue in a recent Tweet – “Vilamendhoo & Meeru say they are 4 star. This just pushes the Sonevas and O&O etc out to six or seven stars. The 5 star barrier is broken.” Adrian is referring to the trend started in Dubai by the super-premium marques calling themselves 6-star and 7-star out of objection to the fact that to put them in the same league as scores of ‘mere’ 5-stars would under represent the unique distinctions they have implemented. One of the most prominent ‘Ratings’ these digital days are from TripAdvisor. But, these scores are not objective ratings against absolute and fixed criteria. They are subjective customer satisfaction marks against relative expectations. Someone who got a great deal on a basic property might give ‘5 stars’ to one quite humble resort, while someone who paid top dollar on an extravagant property might give a ‘4 star’ mark if their parsley came facing the wrong direction. MaldivesComplete’s weighted rating field was an early attempt to reconcile some of this variation in ratings. When MaldivesComplete was launched several years back, several resort portals and tour operators had slightly varying ratings for the islands. I figured that collecting all of these and averaging them would provide both (a) more balanced true rating, and (b) more granular differentiation. But even this approach is growing dated and weaker. A lot of the portals have fallen by the wayside and the tour operator ratings are growing more uniform. Part of the fuel to the uniformity is the crowding at the top. The 5 star problem. All the resorts are sprucing up and putting in investment to tick the 5 star boxes. The operators are happy to going along with this rating inflation because it helps them to justify higher prices. Which brings us back to the ‘dirty truth’ that the hotel industry’s own rating systems are quite dated. They try to quantify quality through system of tick boxes. This is not a problem limited to the Maldives. MSNBC highlighted the subject in its piece “The dirty truth about hotel ratings.” Things like the number of bathroom fixtures determine 5-star threshold leading to inane investments in things like quizzical bidets. People going to 5 star resorts would rather have a nicer shower (rain or waterfall shower), than an unused bidet. Some of the hotel star ratings determined by the number of electrical outlets available, and yet don’t make any assessment of Internet speed, strength and accessibility. I also think that there is somewhat inadvertent muddying between ‘the destination’ and the ‘the resorts’. The Maldives is one of the finest places on earth. It is a 5-star destination. You could put a shack on a Maldivian island and it would be close to a 5-star lifetime experience. As a result, I think that, in the global resort competition, the proliferation of 5-star categorisations is partly due to a global calibration. Resorts that would be 3 or 4 stars on any other ‘ordinary’ beach in the world, become ‘5’ stars in the Maldives. Furthermore, in terms of differentiating Maldives resorts, how do you compare an island with a spectacular house reef but modest infrastructure, with a resort which has no house reef but gold-plated elegance? How do you compare the charm of a more natural aesthetic with the pizzazz of trendy design? I think the Maldives desperately needs a more structured, methodical and managed star system like that run by Michelin. A Michelin star is a major achievement – ‘worth the trip’. Two stars is a rare distinction. Three stars is hall of fame material. More on that later. For those with weaker sea legs, you don’t have to go on the high seas or undersea to have a window to Maldivian marine life. In fact, just this week the topic of glass floors came up on the Trip Advisor Forum. A couple of posters dismissed them as just gimmicks. But I actually applaud them. 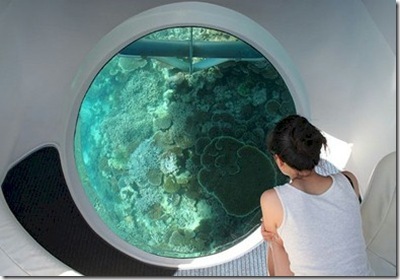 They are fun in their own right to see sea life from your very room. The whole allure of the Maldives is the gorgeous ocean and it seems a shame to ‘leave it’ when you close your villa door coming inside for the night or some other reason during the day. Many times, water villas are built in shallow, sandy lagoons and so there is not the most fish life to see. I always wish that if a resort is going to invest in a glass floor feature, that they make sure it is over some coral cropping that will attract some colourful fish to actually look at. And if there is not a coral cropping handy, then invest in a SeaMarc regeneration frame to start some. But even where there are few fish, the simple window over the water can have a dramatic feng shui effect over the villa. The light comes into the villa with the characteristically aquatic dappling which brings a bit of the playful spirit of the sea inside. Sometimes these glass floors are rather modest little portals which nonetheless provide that stylish design touch. But, the most dramatic glass floor I have found in the Maldives is Velassaru’s Water Suite which measures an expansive 138 square feet. I used to live in a room that was smaller than that. If you fancy an under-the-sea exploration or just a fun adventure to fill out a Male excursion, consider booking a trip on the Whale Submarine. Okay, it’s not a particular feature of Traders Hotel per se, but Traders is both the closest (one block away departing from Jetty 1) and the most tourist ready hotel in Male. If windows over the ocean is not good enough for you, how about windows under the ocean? You can go diving in the crystal clear colourful waters of the Maldives without a scuba course or even holding your breath. 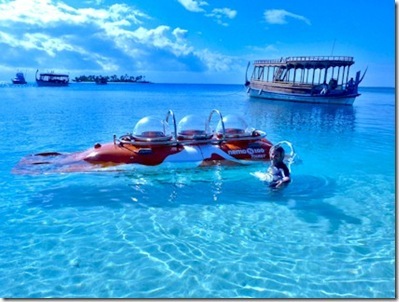 Conrad Maldives Rangali features a Nemo submersible. 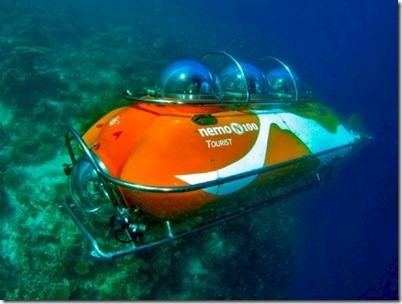 Our family went on a submersible in Mauritius and it was great fun. 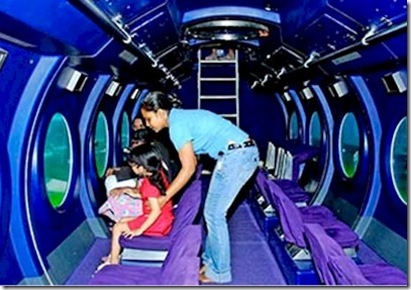 It is a great activity for young children to both as a unique ride in its own right as well as a way to expose them to undersea marvels before they can snorkel or snorkel easily in deeper water. 10,000 micro-leagues under the sea. If you really have a crowd, then consider Kurumba’s own glass bottom boat for a undersea glimpse of the Maldives aquatic delights. 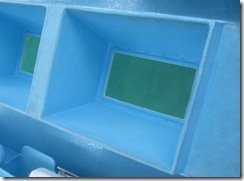 The bigger boat with more glass area does provide a bit more opportunity to see a broader range. 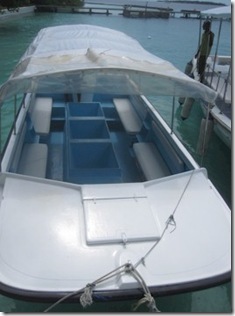 The excursion is great for under those under 6 too little to snorkel. Or perhaps anyone else who can’t take in the joys of snorkelling for one reason or another. Unparalleled snorkelling and work class diving aren’t the only way to explore all of these QI curiosities in the Maldives. 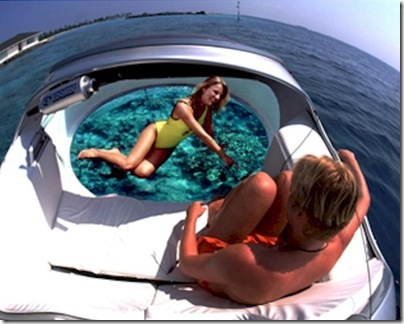 If you don’t want to spoil your finely coiffed ‘do, then consider a glass bottomed boat excursion. A number of resorts offer them – Reethi Beach, Kurumba, Baros, Conrad Rangali, Paradise Island, Coco Palm Dhuni Kolhu and Taj Vivanta Coral Reef. But the top of the line in this unique class of ocean vessels is the Paritetboat brand which both Paradise Island (photo above) and Conrad Maldives Rangali (photo below) feature. Question: What is this a picture of? Answer: A Yellow Box Fish. [Soundeffect]: Buzzzz! Wrong. 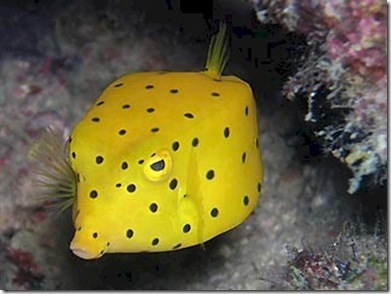 This is also a ‘Yellow Boxfish’ or Ostracion cubicus. 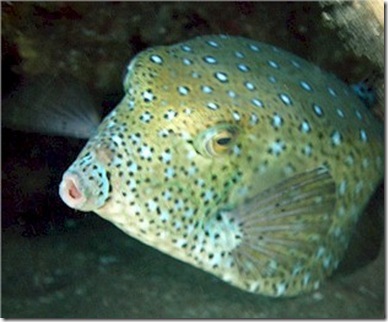 The Yellow Boxfish, which you can see quite prevalently in the Maldives, loses its bright yellow colour as it matures. Thanks Chase (unofficial president of the Boxfish fan club). Question: For those who have been paying attention this past week, what is this a picture of? Answer: Now that is a Nemo fish! I know because it has the three white stripes! [Soundeffect]: Buzzzz! Wrong. Actually, the Maldive species ‘Amphiprion clarkii’ has three white stripes when they are young, but as they mature they turn a dark-brown/blackish colour. Whatever you want to call them, one of the best places to see Anemonefish is Four Seasons Landaa Giravaru. 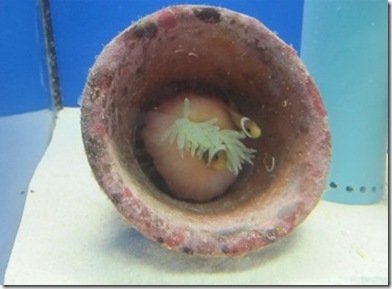 Not just Anemonefish in general, but specifically the babies as their Marine Discovery Center has a breeding research project underway. One downside to the popularity of the Disney film is the popularity of capturing ‘Nemo’ fish for fish tanks. Landaa hopes to be able to improve breeding knowledge to both stock the ocean and to provide an alternative source of supply for fish tanks so they won’t be hunted from the reefs. 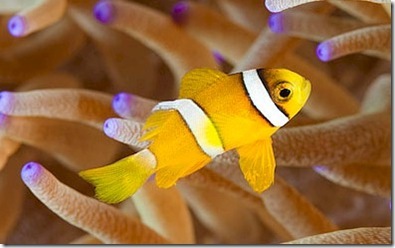 If you thought that Anemonefish were cute, the babies are all more the cuter. I couldn’t get my wife out of the Center she was so entranced watching them dart in and out of their host anemones in an incessant tease of pseudo-hide-and-seek. And not just the anemonefish, but the anemones themselves provided a bit of action. You could see them in all different positions all over the tanks. 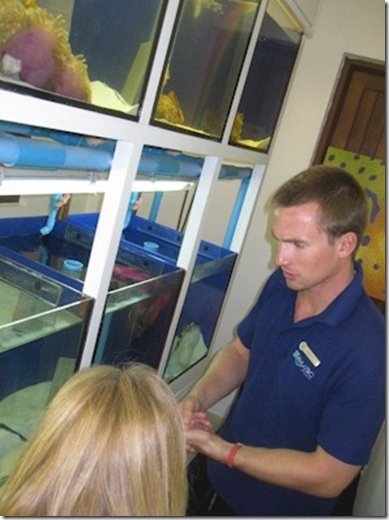 Resident marine biologist Harry Masefield (see photo below) explained that the anemones were quite active and often tried to escape from the tanks by crawling out the top and so they had to devise all sorts of guards. With their swaying tendril-like arms they seem more like colourful vegetation than the quite animated animals that they are.